It's been a while now since I've done one of these posts, but I am once again borrowing the "outside the box" idea from My Hockey Card Obsession. I've mentioned before that I have other interests outside hockey cards and one of those is the reason for today's post. I love my card collection and all, but 99% of it is stored out of sight in my basement, whether it be in boxes or binders, so it isn't something I see immediately when I enter the man cave. That's where having something to hang on the walls comes in handy. I've got a couple of interior walls in my man cave that are perfect for hanging something, so I figured why not buy some full size posters of some of my favorite movies? I've always thought movie posters were cool, but never really thought of buying any for myself until recently. There are a ton of them available on sites like eBay and Amazon. I decided to start with two of my favorite movies: Cloverfield and 10 Cloverfield Lane. They are both full size (27" x 40") and double sided so they can be properly back lit. Cloverfield (2008) is a found footage monster movie produced by J.J. Abrams and directed by Matt Reeves. Today is actually the 10th anniversary of its release. I thought it was a great movie when I saw it in the theater back then and still enjoy watching it at home every now and then. The other cool thing about this movie is the viral marketing campaign that went along with it. While I didn't follow it in real time, because I didn't know about it until long after the fact, it was still fun to read about. The poster itself is pretty sweet with the headless Statue of Liberty. If you've seen the movie or even just the trailer then you can see the significance of this. I like that it is not cluttered up with a lot of text, there is just the title and the release date. 10 Cloverfield Lane (2016) is the second film in the Cloverfield universe, or Cloververse. It was produced by J.J. Abrams and directed by Dan Trachtenberg. It's not a direct sequel to the original, but has been described as a blood relative by the creators. It is actually a great thriller with a bit of a twist at the end. This movie also had a great viral marketing campaign which I actually followed along in real time. The post for this one is pretty cool too, but does have a bit more text all over it. I really like how they used the L from the word lane to represent the bunker where most of the movie takes place. Its also pretty neat how that same line works as the I in Cloverfield. Neither of these were all that expensive, both were less than $20 including shipping. 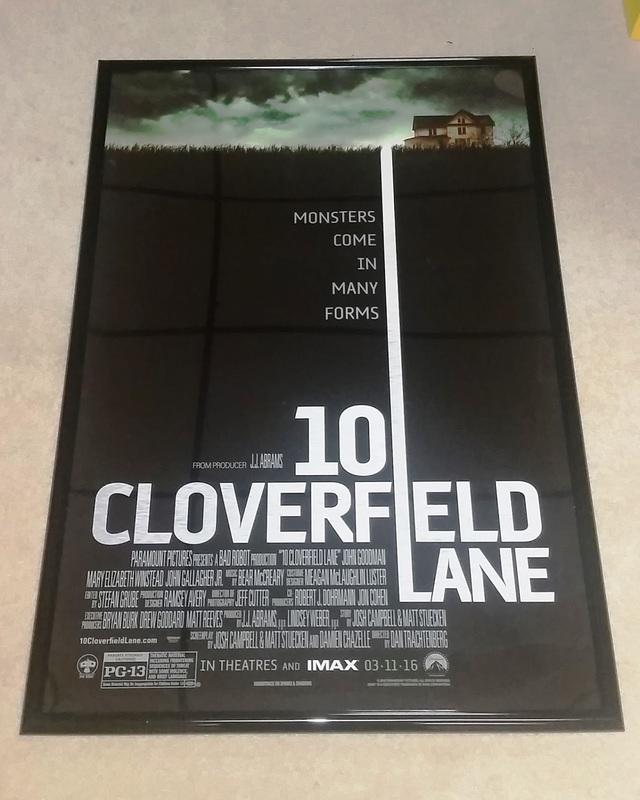 The frames to display them in actually cost more than the posters themselves. Now that I have these two I'm thinking about buying a few more. The next one on my list is another J.J. Abrams project: Super 8. That was another one with a great viral marketing campaign, which helps establish a much stronger personal interest in a such a film. 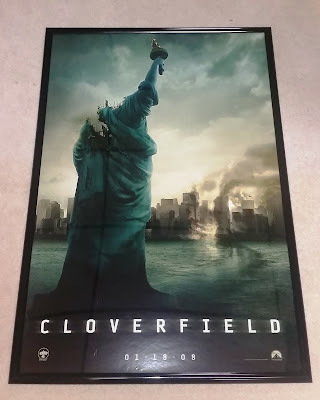 Does anyone else collect movies posters? What do you think of these two and what are some of your favorites?